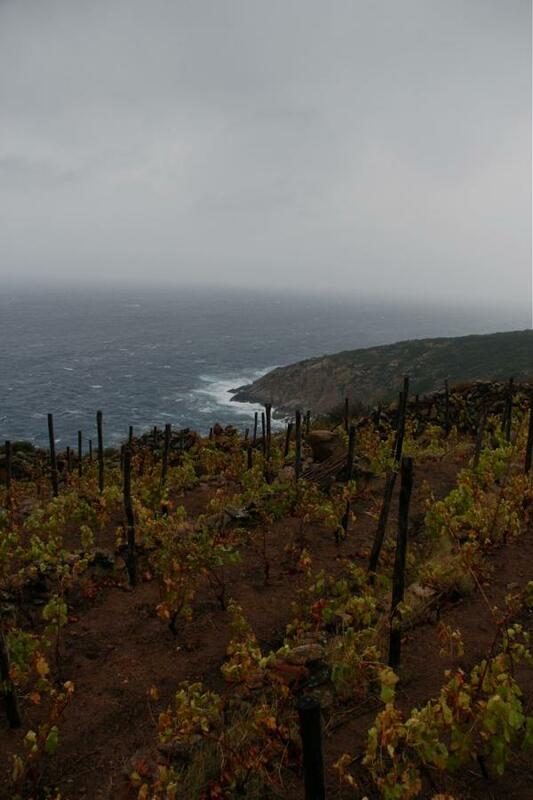 Wines from the Island of Giglio: Altura. On the small island of Giglio off the coast of Southern Tuscany, Francesco Carfagna and his posse of family and friends decided the time had come to bring back Ansonaco, a native grape that at one time covered this island, but in recent times was sparsely found. It's a variety of golden color with grapes of ovoidal shape. This was the foundation of the Altura estate. Francesco has a great restaurant called Arcobaleno in Castello, the main town of the island, so he was well versed in the good wines and winemakers of Italy (i.e., Giampiero Bea!). In 1999, he found some abandoned vines and terraces and set out to refinish the dry walls and rehabilitate the old vines and plant new ones at 200 meters on a high cliff directly above the Tyrrhenean; all of this work was done by hand. All 4 hectares are planted in albarello and guyot, mainly in Ansonaco, (he also planted some massale selection of red from old vines on the island) . 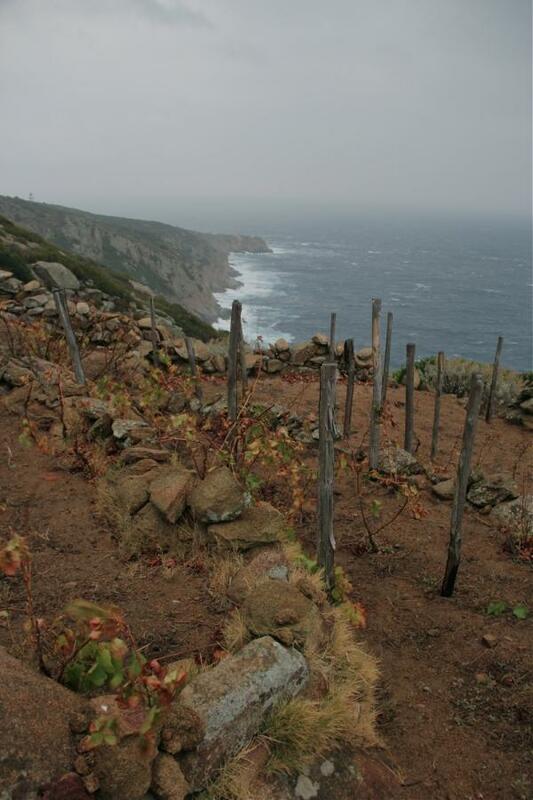 The vineyard work is without herbicides or insecticides and low treatments of sulfur and copper. The yields are about 40 hl/ha. Vinification starts with manual harvest, direct press, then decanted overnight, racked off the gross lees (a small amount of sulfur is added), and then into stainless steel vats for fermentation. No filtration or fining, just racking. The 2010 was put in bottle in May 2011. 2010 is the second vintage release from this estate that is a beautiful work of passion. 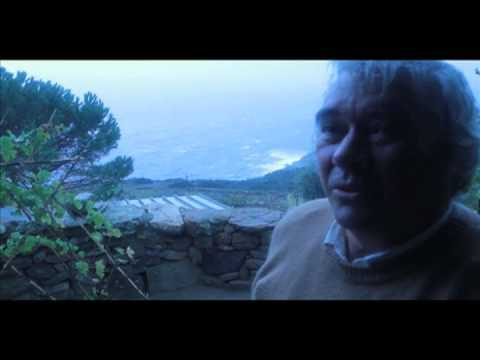 This interview with Francesco Carfagna took place in his vineyards in November, 2011. Tell us about the history of Altura. But I believed in Giglio wine, which was not quite dead, but almost. And so we began to do the opposite of what everyone else was doing, which was to restart cultivating our land. I'm proud to say that other vineyards have since been restored; Giglio wine is again drinkable and flowing across the world! In past centuries, Giglio was famous for its wines. The entire island used to be completely covered in vineyards, though it's hard to believe when you look around and all you see is this "jungle"! 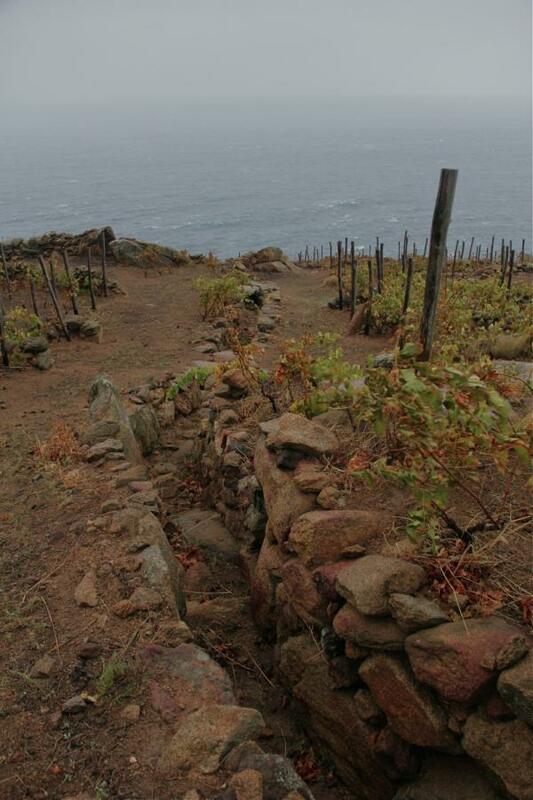 The dream is to see the island completely covered in vineyards again, but I think it will take at least 500 years! Can you tell me about the indigenous grapes you work with? There are many grapes grown on Giglio, but the main grape is Ansonico. It is a gold, oval grape, and it used to be widespread all over the island because it has many good characteristics. For instance, the skin is strong, and this means that it travels very well. Entire ships worth used to be brought to Rome and all over Italy to be sold, because Ansonico is as good for making wine as it is on the table. The reason Ansonico ultimately became so prominent is because it permitted families to live off their land. Up until very recently, most people born on Mediterranean islands made a living off agriculture. Now it is tourism. What was your personal journey into wine? There are two big roots, one that links me to wine and the other to the island. My father had always made wine, and I always went with him to help. So I've been making and drinking wine since I was very young. It was always something I wanted to do and I told myself "I will make wine before I die!". 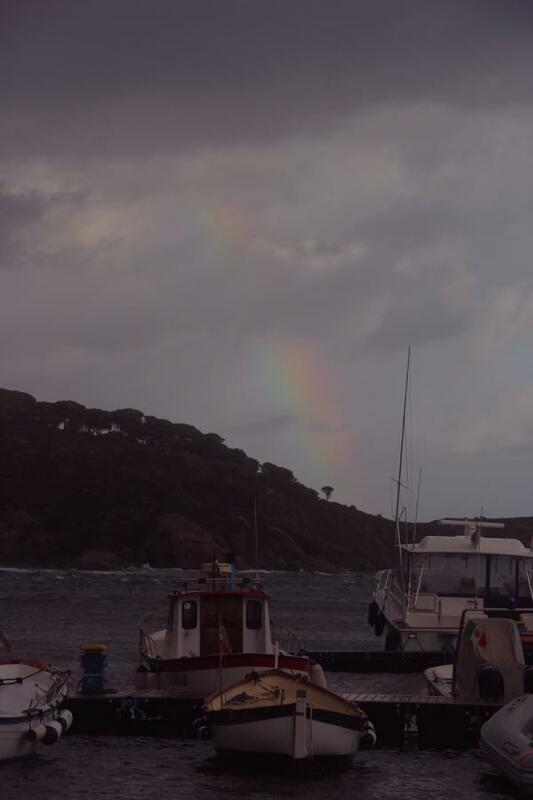 As far as the island, I was born in Rome and I came to Giglio for the first time when I was 9 for the holidays. I instantly fell in love. Altura is simply the combination of these two loves; I had always felt drawn to move here, and because I knew of Giglio's rich past and tradition in winemaking, I put the two together! You've been a supporter of what you refer to as "Alive Wine" since the late 80's through your restaurant Arcobalena. Most people would now refer to these as "natural wines". Having been around these for so long, how do you feel about the current context of natural wine in Italy and beyond? I think that wine is by itself natural if you don't poison it. That's what I learned from my father, who only used grapes. He taught me that making wine is simply helping along a natural process. When we began 12 years ago, there was still no talk of natural wine. And now, even poison is natural! But we've always been focused on making a quality product, and it seems strange to me that people who work with such similar ideas, with such a clearness of mind and heart, would fight amongst themselves by saying: "He's less natural than me", or "I'm more natural than you!" or "I'm more natural than both of you combined!". I think we all share the same heart and passion, but people are getting too caught up in their discussion of "true" or "natural" wines. So I prefer to say "Alive Wine". Because that's what it is! A wine must have its own strength, must follow its own path. Everything is done by hand. If you've seen the land, you know there is no alternative. We let the grass grow most of the year, cutting it only once (we don't clear the remains). We use very limited powdered sulfur treatments (about three a year), because otherwise we'd have some serious issues with oidium. Believe me I've tried without it, and I didn't pick up one grape. I would love to find a way not to use it, but so far have been unsuccessful. The soil is of course vibrant and healthy, full of the bacteria and insects that inhabit it. And we focus on very low yields (30 hl/h). Rabbits and goats freely roam the vineyards, which is nice except that they are always eating the grapes! They are contributing to the low yields! I do add very small quantities of sulfur during vinification (in bottle is comes out to about 25 mg per liter). This has been a hang up for some people, who have adamantly told me that I should not do this. Again, just like in the vines, I have tried… A big part of the last 12 years has been experimentation, and honestly I do think that the wine comes out quite good without any added sulfur during vinification. But with a very small quantity, I personally find it more pleasant than without it. Last question. What do you like to drink? Francesco Carfagna on the history of Altura. 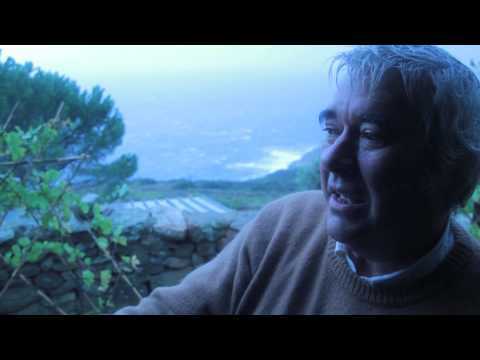 Francesco Carfagna on his introduction to Giglio and winemaking. This visit at Altura took place in November, 2011. "Today really took it out of you. Literally!" 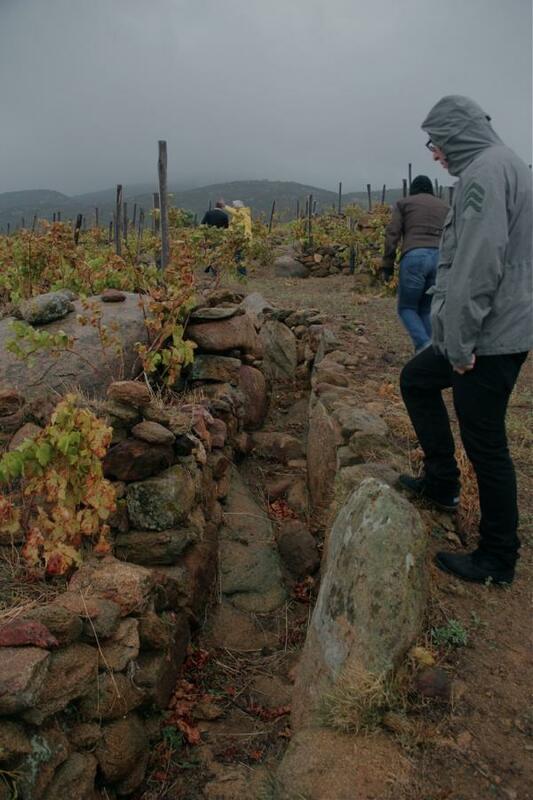 "To take strong action against environmental and social decay by preserving an outstanding wine heritage. This means joining together to foster pride in the island's inhabitants, to create a future that is lively and well lived, not an inhuman shell dried up by a tourist village economy." Francesco cares about Giglio: originally from Rome, he would vacation here with his father and fell in love with the island when he was 8. As a young man, he became a high school teacher in his hometown, but quickly grew to hate it. In 1985, he decided to quit (and in the process lose his pension) to move to the island. 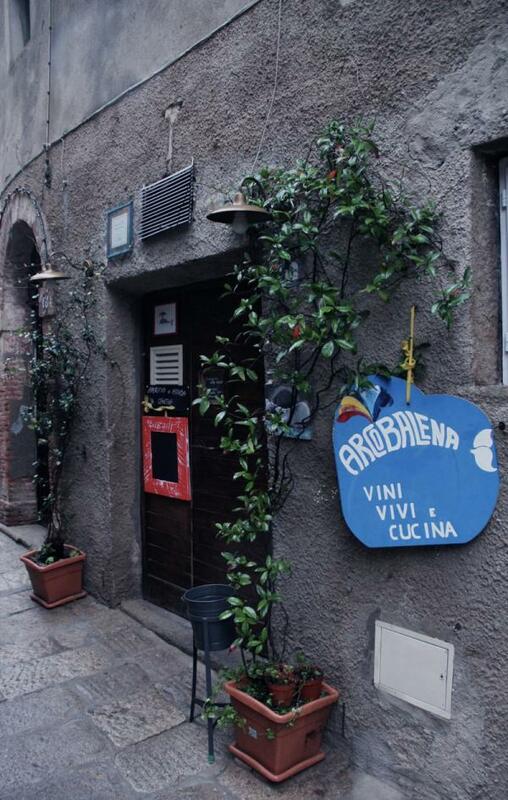 Without a lira to his name, he found ways to manage and eventually opened Arcobalena, a small restaurant and wine bar, in 1987. He then met and fell in love with a young woman named Gabriella, who came for a summer vacation and never left. They ran the restaurant together until 1999, when an opportunity to buy an old house with abandoned vineyards on the south side of the island presented itself. "When I showed up to the appointment, the owner said: 'Let me show you the house.' I told him I wanted to see the vineyards! He was shocked, and told me I was the first person who'd ever asked him that! It wasn't too hard to seal the deal..."
Francesco, who jokingly refers to himself as a "fat old man. ", is now 60 and a staple in Giglio. He's got a happy go lucky personality a lively sense of humor. He's also a talented singer and musician, and every year to celebrate harvest his family (all of whome play instruments) perform a concert at the foot of their vines. 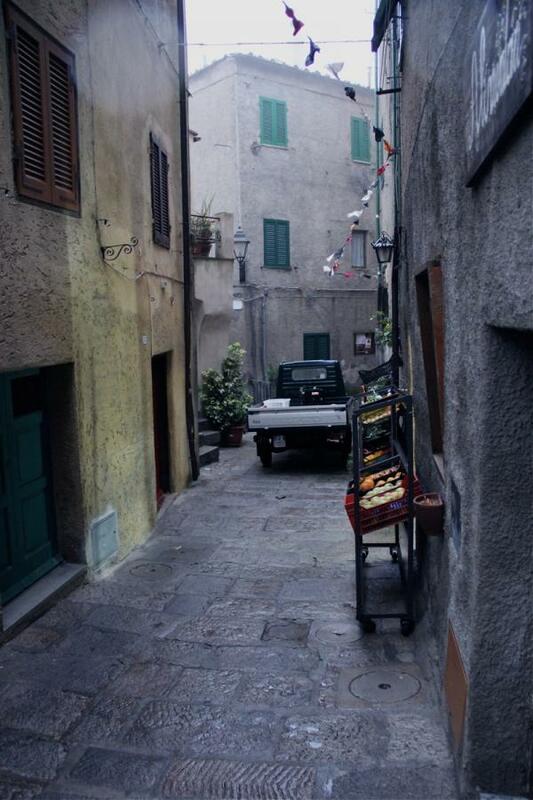 He lives in Castello, the island's main town. 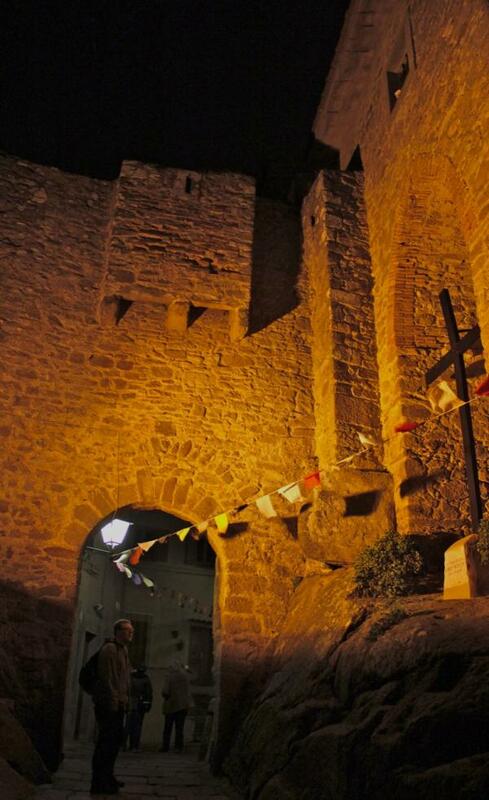 At 550 meters elevation, it's Giglio's main (non beach) attraction because of the incredible remains of its castle town. The town is still inhabited, and Arcobalena is located in the center of it. 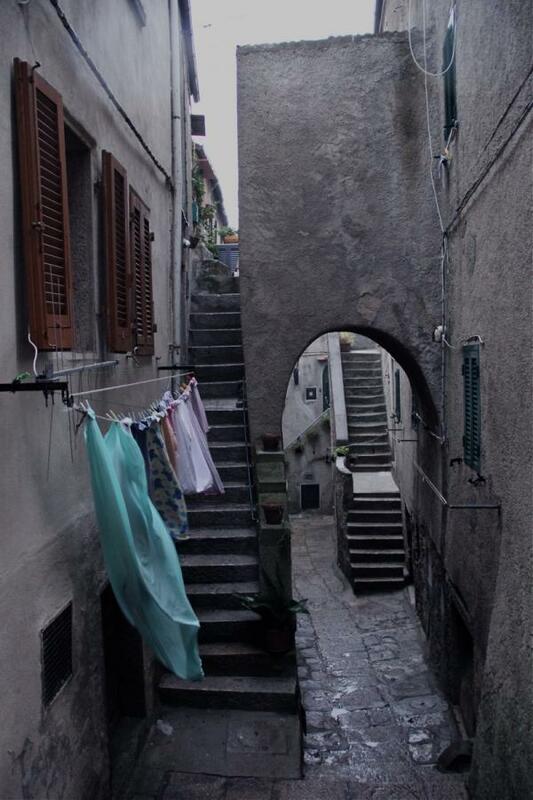 Walking through the narrow alleys and up the winding, twisting staircases, I couldn't help but feel that I'd been here before. A past life perhaps? Then it hit me! I'd never been here before but I'd seen it in film! This castle town could be non other than the setting for one of the climactic final scenes of the 1985 classic Gymkata! For those of you not familiar with the plot of Gymkata, please brush up on the film's surprisingly detailed wikipedia page. The final test of "The Game" is to go through the "Village of the Crazies", where after a valiant gymnastics-infused martial arts display against the villagers, John Cabot is finally surrounded. Fortunately, there just so happens to be a rock in the middle of the village that looks and functions exactly like a Pommel Horse, which Johnny uses to his advantage by pommel-horse-karate-kicking his enemies into submission before escaping. Though I'd convinced myself otherwise, it turns out that Gymkata was actually shot in Yugoslavia. Oops. For those too lazy to use Google Translate, the sign says: "Alive Wine and Kitchen". After the aperitif, we were off out Francesco's cellar. 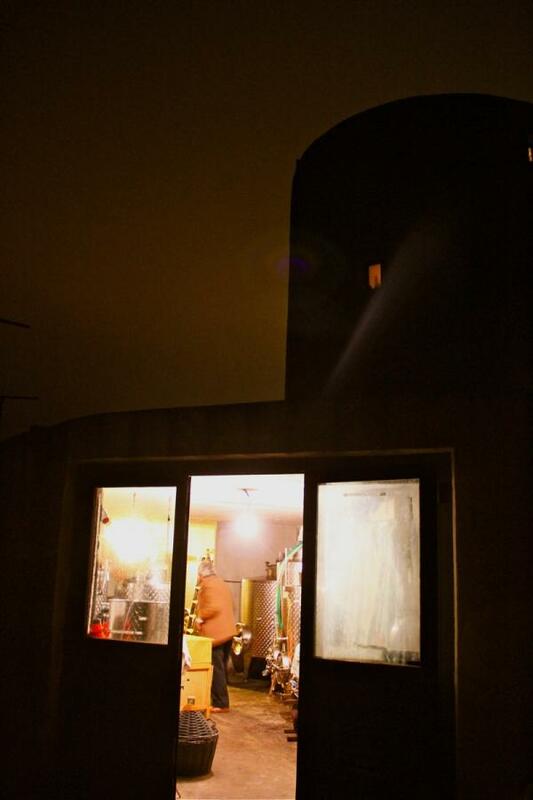 The cellar is located directly below where Francesco's living quarters, an old light house he reconverted with his wife Gabriella. You can see it all the way to the right of the picture below. It suddenly hit me that I was about to taste wine made in a cellar under a lighthouse from grapes indigenous to a tiny island off of Tuscany. It's a shame that wines like Altura's are too often overlooked by the unadventurous; as I was about to discover, the wines are as unique as the island itself. In the cellar, Francesco let us taste the 2010 white and red, the latter still in barrel and quite delicious: fresh, mineral, bright fruit, lively acidity and serious drinkability. The 2011's were also very promising, although the fermentations are very slow this year, particularly for the red. Francesco closed up shop and we were off to Arcobalena for dinner. "These are the anchovies that converted me to liking anchovies." "Man, those are some of the best anchovies I've ever had in my life!" Silvio LOVES anchovies, and apparently gets antisocial when good ones are around because he can't focus on anything else. It was a great meal full of fresh fish and complimented by an Altura vertical of the last three vintages. Alex Finberg went as far as saying that Altura is the best anchovy wine he's ever had and that it was his favorite pairing of the trip so far. "They actually make each other taste better." We left well fed and ready to visit the vines in the morning. When we woke up, it was official: though it had rained a little bit the day before, our good weather streak was over. 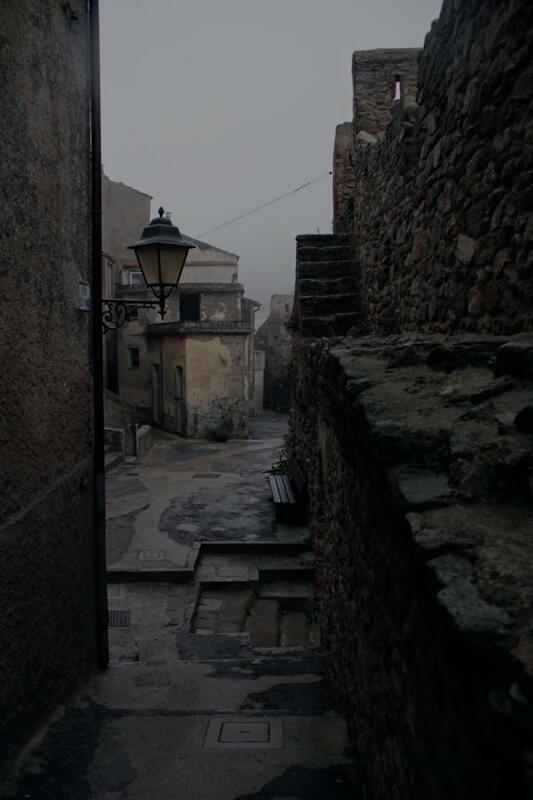 The village was gray, windy and rainy, but Alex and I still wanted to explore the castle town a little bit. Francesco then picked us up and it was off to the vines. Before I go any further, I really need to stress that no pictures can aptly do this site justice. You just have to be there to understand how special it is: the terraces, the water channels, the view of sea... It's just something else. Isolated on the south side of the island, the only way to access the vines is to take a small dirt road that can only be navigated with four wheel drive. The rain and wind was picking up but Alex was still able to get some great shots. When the Carfagnas took over the 4 hectares of vines, they were abandoned. This was great for the purity of the soil, but also meant a ton of work. The family rooted and ripped out all the weeds, and rebuilt thousands of meters of dry stone walls, as well as water channels. The oldest vines are 60 to 70 years and franc de pied, but since the land was abandoned, only a handful are still producing fruit today. Francesco re-grafted, and planted young vines 10 years ago on American rootstock. Everything is selection massale. They also began training the vines, some in Guyot but mostly in Albarello. The soil is granite. There is no choice but to do everything by hand (not that Francesco would do it any other way), and the harvesters have to carry the grapes from the bottom to the top of the hill before loading them onto a four wheel drive truck. Our ferry back to the mainland was at 10:30, so we hurried back to the Port. I made sure to buy some motion sickness medicine. But when we got there, we were informed that the sea was even rougher than on arrival! We were told that if the conditions are like this in the morning, they most likely won't get any better later in the day. We were marooned! Francesco fell in love with the word and ended up using it at least 50 times during the rest of the day. He was also delighted because now we had no choice than to have lunch at the lighthouse. He pulled out the big guns with this local fish. The aperitif consisted of Francis Boulard and Coste Piane, and marked the beginning of a 4 hour lunch. Around 1 hour and 34 minutes into lunch, Francesco's buddy Pietro swung by for a glass. Pietro is an important guy on the island and you have him to thank if you've ever drank a bottle of Altura anywhere other than Giglio: he's the guy that ships all exports and imports to and from the island. 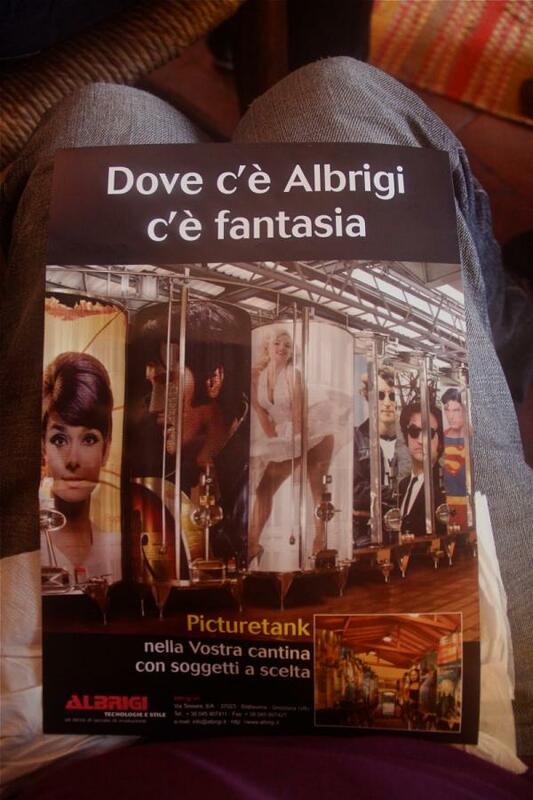 Gabriella also showed me this AWESOME ad she'd just received in the mail for graphically designed stainless steel tanks. 2 hours after lunch we returned to Arcobalena for dinner. We somehow managed to eat all five courses, although Kevin and Josefa had half portions of everything. The plan was to grab the 6:30 am ferry because at this time the sea is at its calmest. Kevin tried to gracefully bow out from the table, but we weren't allowed to leave before Francesco could sing us a little tune on the piano. The instrument was out of tune but it didn't really matter, since he stole the show with his singing.That guy can wail! All of a sudden one of his friends got on the drums, then some other guy was playing guitar and they had a full band going! Francesco kept impressing us with his serious tuneage, and Gabriella broke out into an interpretive dance. It was a great way to be cast off, and after many thanks we finally got back to our rooms for a little shut eye. We woke up to a cold, windy morning, but nothing as bad as the eve. 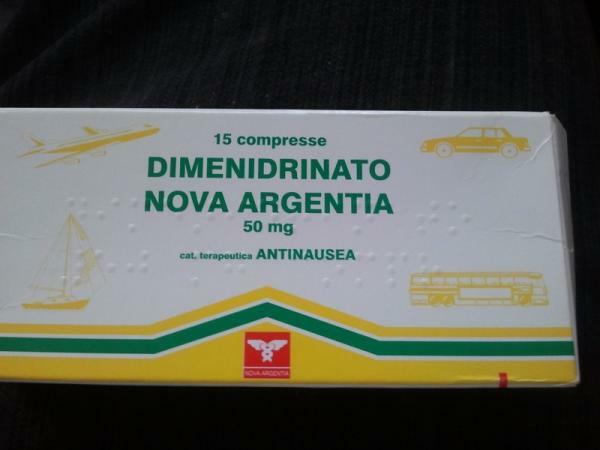 We gathered our stuff, drove to the port and I took a Dimenidrinato. We pulled up to the ferry, and the woman at the ticket booth to tell us the last thing we wanted to hear: the sea was still too rough! We'd have to wait and see if we could take the 9:30. After three hours semi passed out in the car, I woke up to a mob of people storming the ticket booth! The ferry was leaving, and people wanted out. After all, there was a two day back-up of people trying to leave! Kevin fended off an angry German family and made sure we got our tickets. A rainbow lit the sky and we were on our way!